NASA announced today that its Mars Atmosphere and Volatile Evolution (MAVEN) mission has helped the agency figure out why the Martian atmosphere is deteriorating. The discovery of water on Mars suggests that, at some point, the Martian atmosphere was rather lush. “Mars appears to have had a thick atmosphere warm enough to support liquid water which is a key ingredient and medium for life as we currently know it," NASA scientist John Grunsfeld said in a statement." The MAVEN researchers' findings are published across several articles in Science and Geophysical Research Letters. 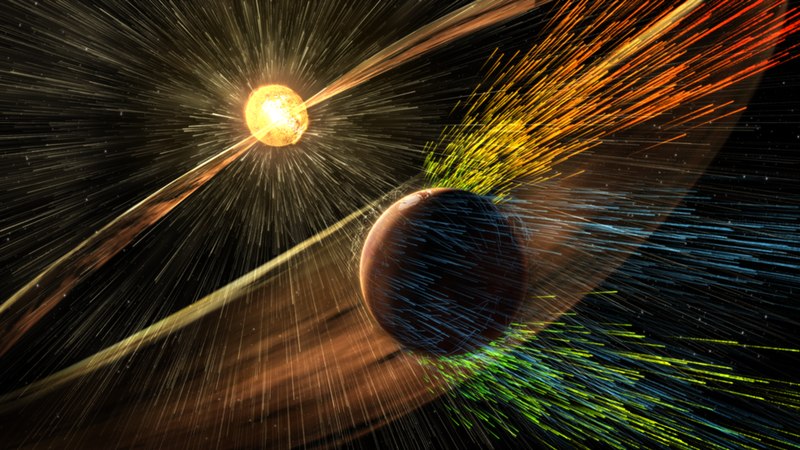 MAVEN measurements indicate that the solar wind strips away gas at a rate of about 100 grams (equivalent to roughly 1/4 pound) every second… a series of dramatic solar storms hit Mars’ atmosphere in March 2015, and MAVEN found that the loss was accelerated. The combination of greater loss rates and increased solar storms in the past suggests that loss of atmosphere to space was likely a major process in changing the Martian climate. Luckily, the NASA scientists explain during a press conference, Earth's atmosphere is protected from major atmospheric loss by our magnetic field. Phew.